After eight years and over a dozen movies, the unstoppable box-office juggernaut that is the Marvel Cinematic Universe (MCU) seems like it could successfully sell the public on any concept, no matter how undeniably bizarre. This is the same studio that made us weep over the death of a tree that said three words. At this point, I think I can argue that the MCU has a higher film-to-film consistent quality of excellence than Pixar, the other most trusted brand in cinema (Pixar’s creative/emotional highs are certainly higher but they’ve had their share of misses). Marvel has earned the benefit of the doubt. The common complaint is that their movies feel too formulaic and insubstantial. I would definitely argue against the latter and the former needs no real defense. Marvel has built an empire on a system that works because it delivers crowd-pleasing and character-oriented blockbusters that are packed with payoffs for fans and newcomers. The alternative, chiefly the dour bombast of the fledgling DC film universe, isn’t much more appealing, but then again I have been labeled a “Marvel shill” by those infuriated from my inconceivable pan of the very conceivably terrible Suicide Squad, so take my word with some skepticism. For any other brand, Doctor Strange could be too weird. With the MCU, it’s another comforting sign they really know what they’re doing. 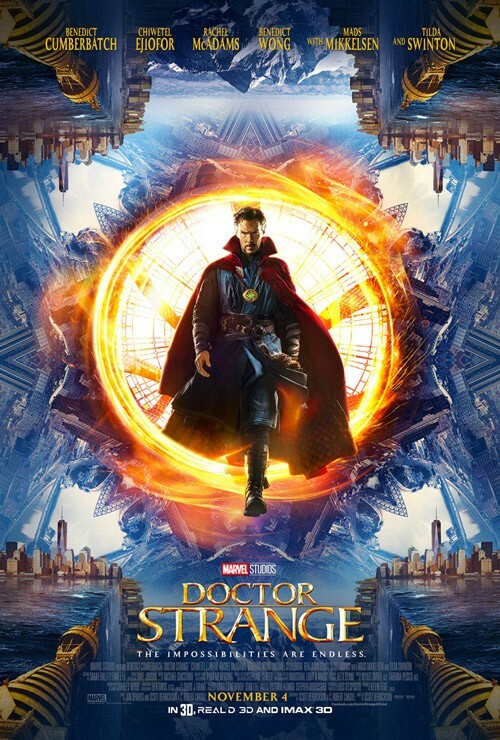 Stephen Strange (Benedict Cumberbatch) is a brilliant New York neurosurgeon who loses full control over his hands after a horrible car accident. He travels to Nepal to seek out holistic remedies to aid his recovery and instead finds the Ancient One (Tilda Swinton), a powerful mystic. She takes a liking to Strange and invites him into their temple to train as a pupil of powerful sorcerers (Chiwetel Ejiofor, Benedict Wong). Former sorcerer, Kaecilius (Mads Mikkelsen), has gone rogue and believes the only way to survive the oncoming cosmic giant Dormammu is to join him. Doctor Strange must summon all the skills of multiple dimensions in order to save the day. Doctor Strange is at its core an origin tale and one that feels somewhat familiar at least for its first half. It’s likely not an accident that Stephen Strange bears more than a passing resemblance to Marvel’s other egotistical, arrogant charmer, Mr. Tony Stark. He’s a man who has to be humbled and learn the error of his ways and his outsized hubris, which makes for an effective character arc to structure an introductory movie around. It also makes fine work of Cumberbatch’s otherworldly sense of haughty superiority (I can’t wait to watch future Strange and Stark banter). The first half is essentially Training Montage: The Movie. Strange learns about the ancient mystic arts and, more importantly, super powers. The movie doesn’t follow Thor’s lead and argue that magic is another form of science. It declares magic as its own thing. Strange learns how to open portals, how to shift reality, how to astral project, and even how to stop time. Each new power is given proper attention and the learning curve adjusts as needed, allowing an audience to process the various rules and dramatic stakes. It’s a structurally smart assembly of mini-goals to keep an audience secure in what otherwise could be overwhelming for its New Age mumbo jumbo. 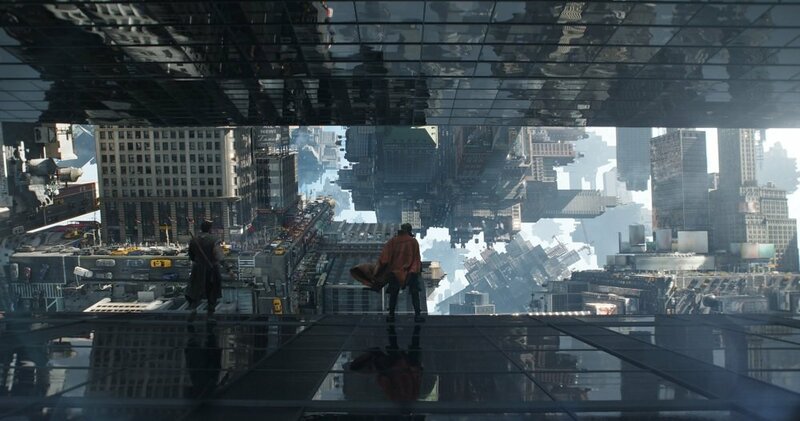 After the origin heavy lifting is taken care of that’s when Doctor Strange becomes everything I could hope for; namely, a highly imaginative action movie with a breakneck pace and a boundless sense of imagination. This movie feels kinetically alive and unpredictable in ways that few Marvel movies even approach. Once Strange and Kaecilius meet at the halfway mark it becomes a gallop to the finish line with one highly entertaining action set piece after another, and even better they are wildly different. We don’t have battles about running and firing weapons or just punching bad guys extra hard; instead, it’s reality itself that bends to the will of the fighters. Characters walk on walls, shift the state of architecture, create teleportation portals to hop in and out of, shift the entire gravity of the world to force people away from said portals, and turn New York City into a kaleidoscopic playground. There’s an extended chase scene that literally feels like a series of M. C. Escher paintings come to starling life. The sequence is eye-popping in the best way and, shocking enough, it’s not even the climax of the movie. There are so many fun possibilities for crazy action sequences. 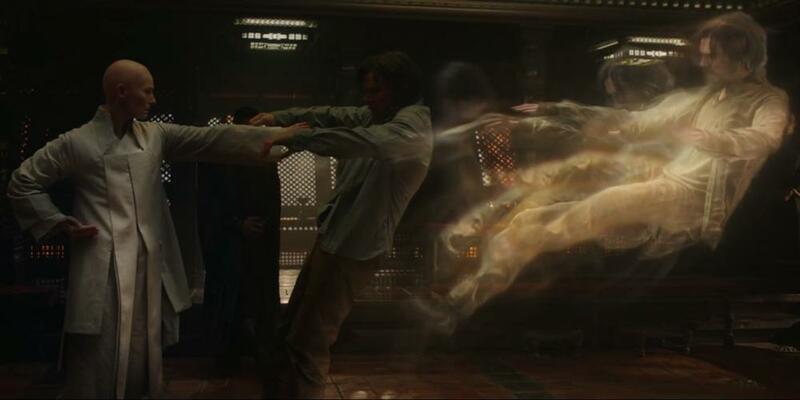 There are other sequences that stand out, such as an out-of-body fight between two warring astral projection foes. The real climax of the movie is something I’ve never seen before, a battle that takes place as time resets. The smoldering ruins of a cataclysm are put together brick-by-brick and characters dodge the debris as it rapidly reforms. It’s visually thrilling to watch but it’s also a clever sequence because there are continuous opportunities for danger and in many ways that your brain cannot naturally suspect, like when a wall reforms and traps someone within. 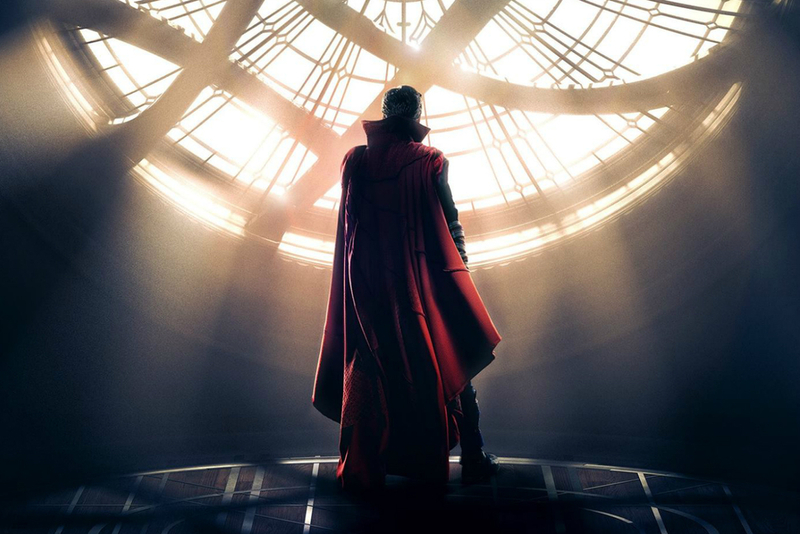 Whatever you’re feeling on the general MCU and its blockbuster formula calibrations, Doctor Strange is a great leap into something different, momentously exhilarating, and inventive. Director Scott Derrickson (Sinister) was an intriguing choice considering his background in supernatural horror, but, as should be obvious, the MCU overlords score again with their foresight and risk-taking. Derrickson’s visual influences hew much closer to Christopher Nolan and the Wachowski Siblings than the greatest hits of the MCU, and that’s exactly what this world needed to stand out on its own. I cannot overstate just how enjoyable the last hour of the movie can be, though this isn’t meant as a backhanded slight against that first half. The action-packed hour only works because of the setup from before and laying a careful foundation for the characters, their dynamics, and the rules of this trippy universe that bends conventional physics. All the careful world-building and training montages set up the sprint through a fireworks factory of fun, and I had a smile plastered to my face the whole time, eagerly anticipating the next detour into crazy. I’m even going to impart you, dear reader, with some advice I haven’t given since 2013: if possible, see this movie in 3D. The hypnotic visuals and elusively shifting reality demand to be seen with the added help of the third dimension. The movie will still obviously work in a non-3D format but why deny yourself the full impact of these incredible visual experiences? New York City contorting is worth the extra few bucks alone. The acting is another highlight for such an enjoyable movie. Cumberbatch (The Imitation Game) easily makes for a terrific lead actor, someone who can bring a sense of gravitas or dry sarcasm when called upon. His sense of comedy is underrated and this Sorcerer Supreme gets his fair share of punctuating the weird and wild with a perfectly delivered joke. A bit with a sentient cape allows for great physical comedy. His American accent is also much improved from earlier far spottier efforts in 2013’s August: Osage County and 2015’s Black Mass, which featured perhaps the worst “Baustun” accent in recent memory. Cumberbatch is the charming smartass, the know-it-all who realizes how much he still has yet to learn, and his final showdown with the Big Bad Evil sheds large-scale disaster for something much more personal (no giant portal in the sky or faceless army of monsters/aliens, hooray!). His character arc of learning that it’s not about himself culminates in a brilliantly conceived sequence that satisfies. The other standout is Swinton (Snowpiercer) who once again melds with her character, who happens to be a mysterious Celtic mystic who may not even be human. The early half is instantly elevated when Swinton is on screen. She presents a matter-of-fact sense of the preposterous that is downright serene. It’s also a role that is more than just a requisite mentor as The Ancient One has some secrets that will be revealed. I was also genuinely pleased with how much screen time Mikkelsen (TV’s Hannibal, Rogue One) gets for his villain, who has a wicked deadpan. I pity Rachel McAdams (Spotlight) who plays the underwritten love interest role we’ve seen similar to Natalie Portman prior performances. She at least gets a few good scenes before being forgotten. With each additional entry into the ever-expanding Marvel Cinematic Universe, the fan in me gets to reexamine and realign the pecking order of quality. In my own subjective rankings I would say that Doctor Strange is just below the top tier of the MCU (Guardians of the Galaxy, Civil War, Iron Man) and on par with Winter Soldier. This is a highly enjoyable and highly imaginative action movie teeming with eye-popping visuals. Many of the visual set pieces are stunning and demand to be witnessed on the largest screen possible. The movie never loses its sense of fun and wonder while still respecting the dramatic stakes of the cataclysmic events, and when it goes big it makes it matter. I have no previous attachment to this character and Doctor Strange was just about everything I wanted the film to be and then some. It’s another sign that Marvel can take any property and find the formula to make it a satisfying smash. I enjoyed Doctor Strange enough that I want to see it again, and this time even bigger to better soak up the strange.